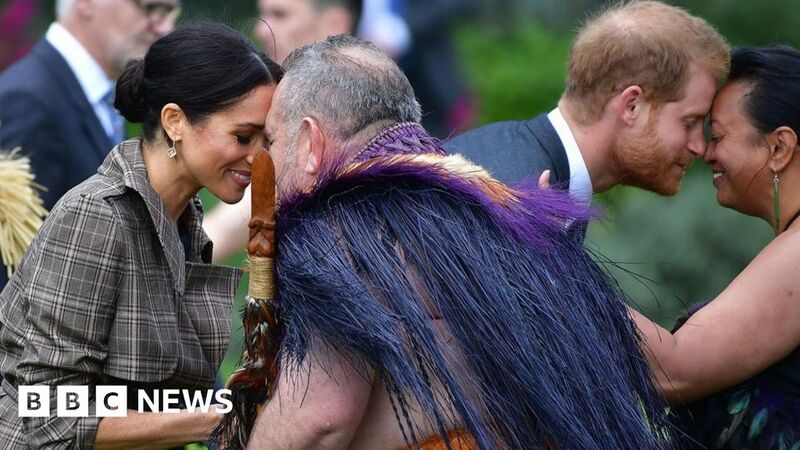 The Duke and Duchess of Sussex were greeted with a traditional Maori greeting in New Zealand. At the Government House event, members of the New Zealand Defense Force saw a haka for the couple. They were greeted at the airport by Prime Minister Jacinda Arden, who had flown in with the Kiwi Invictus team from Australia. The couple set out to receive New Zealand Governor-General Patsy Reddy. The Invictus Games 2018 had ended the day before in Sydney with a graduation ceremony in which both Meghan and Harry made speeches. After the arrival ceremony, their first engagement was to visit the Pukeahu National War Memorial Park, where they placed a wreath at the Tomb of the Unknown Warrior. The park contains the UK War Memorial, designed around the trunks of the Royal Oak and Pohutakawa trees merging into a single canopy. At Government House they met with Mrs. Arden and opposition leader Simon Bridges for an event celebrating the 125th anniversary of women's suffrage in New Zealand. The Duchess wore a traditional Maori necklace. In a speech on suffrage, Meghan said that the women who fought for the move were "universally admired." New Zealand was the first country in the world to give women the voice. Visits to Auckland and Rotorua will also be part of the New Zealand leg before returning to the UK on Thursday. On their marathon trip they also visited Fiji and Tonga.